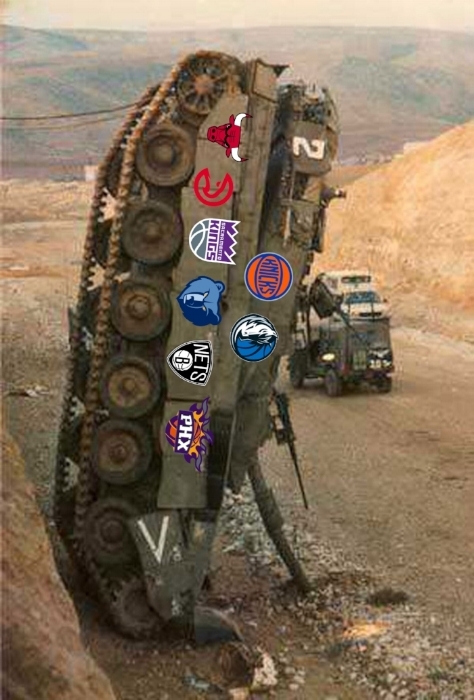 It’s finally time for some post-all-star break NBA basketball, which means tanking season is fully upon us. Early this week, we learned that the Bulls and Knicks will be diving straight in, both announcing changes to their starting lineups. Emmanuel Mudiay will slide into Coach Jeff Hornacek’s starting five, sending 47-year-old Jarrett Jack back to the pine. It might not happen on Thursday, but eventually Courtney Lee could lose minutes or even his starting gig to Frank Ntilikina aka Frankie Nicotine aka Frankie Smokes aka The Marlboro Man. As the Knicks look to develop their younger players, they will certainly be relying on the legendary Michael Beasley to handle the scoring load. B-Easy told the Bleacher Report last October, “As far as talent-wise, I match up with Kevin (Durant), LeBron (James), I match up with the best guys in the world.” You may have heard of the rapper that goes by 2 Chainz, but Beasley should be called 3 Watchez. Assuming the Knicks continue to give Enes Kanter his normal minutes, he’ll be in a great spot against Orlando. On the season, the Magic rank second-to-last in team rebounding rate (47.8%). Whether its Nikola Vucevic or Bismack Biyombo playing center for O-Town, both hold identical rebounding rates of 17.1% on the season, much lower than Kanter’s rate of 22.9%. Power forward Aaron Gordon only sports a such rate of 13.6% on the season. On Fanduel, Enes has exceeded “5x” value 52% of the time this season – including eight out of his last 12 games (67%). As long as he gets his full complement of minutes, he’ll be a solid play and should go somewhat overlooked – as usual. You could take the harder way and play Hardaway, but it might take your heart away. It’s always high-risk, high-reward with Tim Hardaway Jr.
With Gordon and Vucevic scheduled to make their returns to the Magic starting lineup Thursday, Mario Hezonja’s dfs worth will take a significant hit if he moves back to the bench. Opposing guards had been demoralizing the Knicks before the ASG break (see T.J. McConnell and Tomas Satoransky), putting D.J. Augustin into play solely because of the delicious matchup. Augustin, a non-score-first point guard, would in theory benefit with Gordon and Vuc on the court. Simply put, Evan Fournier is not very good at the game of basketball. It is worth nothing that he has played his best ball of the season against Spike Lee’s favorite squad; of his four highest fantasy scores this season, two have come against New York (46 & 36 points), while the other two have come against Brooklyn. That said, I still don’t want to pay $6.4K for Fournier when the Magic are at full-strength. The Baby Bulls announced some major rotation changes: David Nwaba and Cristiano Felicio will start ahead of Justin Holiday and Robin Lopez, while Cam Payne will assume backup point guard duties, pushing Jerian Grant out of the rotation. Kris Dunn finally returned to action just before the All-Star break, and it will be fun to watch him play alongside Zach LaVine for the rest of the season. Chicago’s backcourt of the future has only started three games together this season, and LaVine was even limited to only 19 minutes in all those contests. I’d love to take advantage of Dunn’s bargain-basement price of only $6.4K, but I am worried after the Bulls front office announced that they will still be “monitoring” his minutes (Chicago Tribune). “The Other KD” has excelled with Nwaba on the floor this season (stats from NBA.com). Dunn’s possible restrictions will mean increased usage and ball-handling opportunities for LaVine, who’s also underpriced on Thursday’s slate. The very same can be said about Nwaba, too. Normally, we love when we can snag a starting center for only $3.5K – except when his name is Cristiano and he’s not playing futbol. On the flipside, Joel Embiid should EAT against the young Felicio, and I wouldn’t even be surprised if Bobby Portis comes off the bench and ends up logging more minutes. If you’ve never seen Felicio play, just picture fellow Brazilian big man Nene pushing everyone around in the paint: Cristiano is the exact opposite. Can somebody check her tour schedule to see if she’ll be in the Chi on Thursday? Either way, I expect Embiid to risk it all and put on a show. 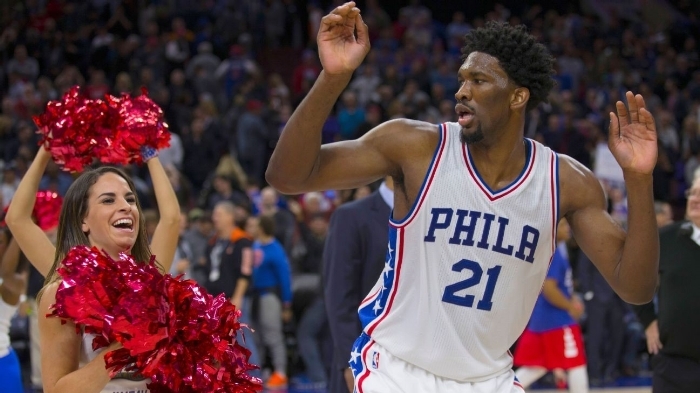 There could be some merit in stacking Embiid with Ben Simmons, even though it’ll cost you a pretty penny. Simmons already has a 19/17/14 triple-double against the Bulls, as well as another 19/11/9 performance. The Wiz versus Cavs game has the second highest total of the night (220), but outside of LeBron James, is there really anybody we want to target on Cleveland? Because the PF position on Fanduel is far from star-studded, I think Larry Legend, Larry Nance Jr., makes for a decent play. $9.5K in the highest salary of the season for Brad Beal, and at that price you need to get at least 50 fantasy points out of him. I’d rather take the salary relief and roll with Otto Porter, or even Markieff Morris if I want some exposure to The District. Fill-in point guard Tomas Satoransky was spitting hot fire in his final three games before the break, but take note that backup PG Tim Frazier was out with a concussion. This allowed Satoransky to see minutes in the mid-30’s, as opposed to the 22-25 minutes he saw before Frazier’s injury. Another team en route to Tanktown, the Brooklyn Nets, will be without two rotation players in Rondae Hollis-Jefferson and Caris “Lil Uzi” LeVert. Joe Harris is near the minimum salary and should draw the start, but if him and Nwaba see the same number of minutes, then nine times out of ten Nwaba is the superior dfs play. Even though he’s coming off the bench, D’Angelo Russell, with LeVert out, will be tempting on Thursday. Since his return in January, he’s seen over 30 minutes only once – and that came in a double-overtime game. D-Loading’s price has been as high as $8K this season, so grabbing him at $6.1K on Fanduel and $5.6K on DraftKings seems like a wise strategy. Another day, another smash-spot for Sweet Lou Williams. Having already dropped a career-high fiddy (50) points in Oakland last month, Lou’s teammates will be counting on him to do more of the same if they want to keep this one competitive. It’ll help Sweet Lou if Avery Bradley, whose availability Coach Doc Rivers called “50-50,” is unable to suit up on Thursday. Very rarely this season has it been advantageous to roster one of the Warriors’ “big four” when the team is at full strength, but I think a compelling case can be made for Steph Curry here – especially on Fanduel where he’s only $9.3K. Even though Chef Curry’s been on a slump that carried over into the All-Star Game, he gets a chance to break out in a nationally-televised home game against an opponent that he’s already scored 64 and 54 fantasy points against this season. The Hornets, Cavaliers, Clippers, and Wizards are all on the first night of a back-to-back.